The Dutch Reformed, or Reformed Church, an ancient institution in New Jersey, came to Newark relatively late in the 1830s by way of the tiny Bergen settlement of Schraalenburgh, an outgrowth of Dutch New Amsterdam. Newark's original settlers were from the New Haven Colony, which settled not only our town, but also Elizabethtown and Woodbridge. Following the settlements of both the Hackensack and Passaic valleys, the Raritan lands were opened up to speculation and eventual settlement. According to noted Dutch settlement historian Adrian Leiby, early Newarkers probably would have been happier under the more democratic and liberal Dutch than in the hands of English Restorationists. But in 1664, it was all over. Holland had been defeated by England and New Amsterdam had become merely a historical note. For the next century and a half New Jersey was unquestionably English. It was another 179 years before the Dutch came back to town, this time in the form of the Dutch Reformed Church. Among the earliest Dutch churches in the state was the one founded at present-day Jersey City in 1660. As one historian wrote: 'It is not only the oldest site in New Jersey continuously devoted to such a purpose, but, we believe in the United States of America.' The church at Hackensack, which erected its first building in the 1680s, claims to be the state's second oldest Dutch congregation. The edifice was an octagonal structure on the site of the present church. Another of the old churches, and the one most closely associated with Newark, is the Reformed Church at Belleville, established in 1697 not only by the Holland Dutch but also by French and other Europeans from New York, Bergen and Hackensack. Well-known names associated with the Belleville church included the Van Cortland family, and Josiah Hornblower, who brought to America the first steam engine from England for the Schuyler Copper Mines. The Belleville church, built in 1725, also was associated with Aarent Schuyler, father of Col. Peter Schuyler, Newark's first military hero and a veteran of the French and Indian War. The present Belleville church that one passes along on elevated Route 21 was completed in 1852. Its cemetery and the nearby burial grounds contain some of the state's oldest and most distinguished occupants, including the Rutgers family. The second half of the 19th century saw the establishment of several Reformed churches in Newark: First Reformed in 1833; Second Reformed, 1848; North Reformed, 1856; Third Reformed, 1848; West Dutch Reformed, which is now Grace Reformed, 1886; Christ Reformed, 1872; Christ Dutch Reformed, 1873; and East Dutch Reformed, now Trinity, 1869. Today, as the century nears its end, stately North Reformed Church remains along with Trinity and Grace. Newark's First and Clinton Avenue Reformed churches. In 1833, Newark's First Reformed Church was established at 211 Market St. A committee headed by Moses Dodd petitioned the Reformed Classis of Bergen to organize a church at Newark. Services began almost immediately under the leadership of the Rev. Dr. Wells, who saw the fledgling congregation through the Panic of 1837. Wells was followed as pastor by the Rev. James Scott, who saw the emergence of several new churches from the parent congregation. At the end of the church's first three years, membership in First Reformed had risen to 300. By 1843 it had grown to nearly 600. Three Reformed churches had emerged from the original religious body including Second, Third and North churches. The congregation soon outgrew the original Market Street building, prompting a 1857 modernization of the old structure with a new Romanesque brownstone front. But change was in the air as the Market Street location no longer was felt conducive to worship. As a result, the original church site was sold for a new location at Clinton and Johnson avenues. After 60 years of worshipping at Market Street, the church moved to the center city. Within a short time this site too proved uninviting, either because it was so far away from the downtown or because many church members had started to move to the suburbs. The result was a merger of First and Clinton Avenue churches. 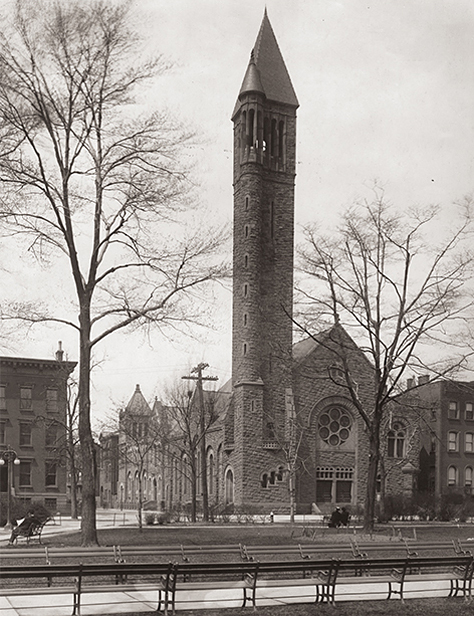 Clinton Avenue Reformed Church had stood at Lincoln Park since 1868. This building of local brownstone was described as in the 'modern Gothic style and of large and elegant proportions, with buttressed walls.' Although the building has changed hands and names several times in recent years, it continues to remain an important architectural anchor on the north side of Lincoln Park—a reminder of the importance of the area when it was one of Newark's several silk stocking districts. In 1933, on the eve of the Reformed Church's Newark Centennial, the church claimed several hundred active parishioners with an overall enrollment of about 1,000 and a budget of $15,000. For more than 30 years, it supported a missionary in China. The church also provided a student scholarship for a Kentucky youngster and supported a trained nurse assigned to far off Arabia. Second Reformed has had several different existences. It was built as a Reformed house of worship, became a Catholic Church, served as a social/community center, and again became a Protestant church. Located at Ferry and McWhorter streets, the church in recent years briefly housed the city's only glockenspiel. In 1848, Second Refomed's congregation decided to establish a Sabbath School for Bible instruction east of the New Jersey Railroad Penn Station in what was then the Ironbound section of the city's Fifth Ward. On April 28, 1848, the Classis of Bergen granted the petitioners permission to form a new church. The cornerstone was laid September 25, 1848, with the structure completed and dedicated on May 8, 1849. It is brick, 47 by 76 feet, with a tower. The front facade includes a wide porch with a double set of flanking columns, and a central bell tower of brick over the central door. The original tower had a long louvered belfry at its base and a needle-like spire with tiny lights. The walls were thick and supported by pilasters. Originally, the interior molding reflected a classical simplicity and a focal point of the interior was the artificial apse and heavy wood organ loft projecting over the pews in the rear. The extensive use of marble and installation of historic ceiling murals were added in the 1980s and in 1990, when the church was remodeled for use as a social service agency. Today the site is being returned to its original purpose as a house of worship. Perhaps its most unique feature is the fact that America's first saint, Mother Cabrini, taught Sunday school in the basement of the former Dutch Reformed building when it was still a Catholic church. But times were not always good for the old church. Two nearly disastrous fires, one in 1922 and the other in 1931, came close to destroying the structure. The first was started by two boys. The 1931 fire, which occurred within months of a fire that destroyed Second Presbyterian Church across Washington Park, was traced to faulty organ wiring. So spectacular was the 1931 fire that 10,000 people supposedly witnessed it. Damage was estimated at $100,000. But where there was a will there was a way to restore the great church. In 1957, as North Reformed prepared to celebrate its centennial, considerable redecorating of the old sanctuary was to take place under the watchful eyes of the Rev. Dr. Howard Hageman. When asked by an outsider why so much money and attention was being paid the old church, the answer was: 'It's a good deal more than a building; it's a kind of shrine, It's where all kinds of memories are clustered, where your parents and even grandparents worshipped.' Indeed, for North Reformed is an integral part of the very history of Newark itself.